Stewart Title Guaranty Company applied CounselLink to modernize and manage the process of handling Stewart Legal Services’ growing volume of billings, maintain good relationships with outside counsel, and save the company time and money. Denise Carraux, Vice President of Legal Automation and Process Management for Stewart Legal Services, leads a team responsible for managing invoices for Stewart’s growing Legal Services group and, principally, eliminating a labor-intensive paper process that was prone to errors and required numerous revisions to billings. Ms. Carraux manages Stewart Legal Services’ automation systems, including matter management, policy loss systems, and accounting system integration. “We were looking to implement an e-billing system, but there were concerns about the cost and whether we could get the level of security we needed,” she said. At the time, Stewart Legal Services’ invoice volume was rapidly increasing and a team was processing some 1,500 invoices per month, essentially by hand. While half of the invoices Stewart Legal Services processes are electronic, the remainder are available only in hard copy, as the company does business with small law offices that may not have the technology to send electronic invoices. “We had to find a way of getting 100 percent capture of invoices in any format,” she said. This was necessary to avoid creating process difficulties for the company’s legal vendors. “It had to be easy for them. It was a real challenge, we thought,” Ms. Carraux said. the CounselLink web-based application, backed by excellent online security for Stewart’s vendor law firms and affordability as an enterprise solution, was able to address and resolve internal questions. Greater control. CounselLink allows Stewart to capture and store all invoice entries from paper or any other type of source into a common electronic format. “We really liked that CounselLink offered a service to process paper and transform the information into an electronic format. We just didn’t see the value of having a system that couldn’t capture everything,” said Ms. Carraux. Improved efficiency. CounselLink streamlines the invoice review, approval, and payment procedures by automating the entire process. The SmartReview technology reads, categorizes, and reviews the details of every invoice charge and automatically adjusts charges that are outside of Stewart’s billing guidelines that have been customized as part of the service. “CounselLink helps us control costs by catching more billing errors such as double-billing or incorrect charges, and makes it easier for our people to review the invoices,” said Ms. Carraux. Automated workflows move invoices to the appropriate reviewers to ensure that the right approvals are received. CounselLink support. 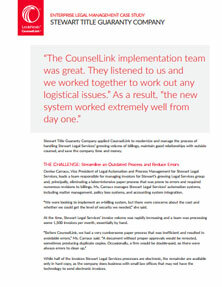 With the help of CounselLink experts, Stewart was able to implement and introduce its new system internally to the Stewart Legal Services team and to their diverse outside counsel community in a short period of time. In place for approximately one year, the CounselLink service is only just beginning to reveal its full potential for Stewart. According to Ms. Carraux, the system is paying for itself in the cost savings. But it is the efficiency increases where the effects are most apparent. She indicated that the previous system was “very manpower intensive … what used to take an inordinate amount of team time is now manageable,” Ms. Carraux said. On the provider side, she said some of their law firms were initially wary of having to switch to a web based system, but once they understood the simple process and the experience, “they are very happy. They get paid faster. Things aren’t getting lost, misrouted, or miscoded. They’re pleased with the new system. At the corporate level, Ms. Carraux and her Information Technology team have developed a winning relationship with CounselLink. By integrating CounselLink with Stewart’s existing systems, information flows seamlessly from one to another, eliminating the need to re-key information and reducing the possibilities of errors. Stewart Title Guaranty Company is a Stewart company, part of the Stewart Information Services Corporation (NYSE:STC) family of companies, based in Houston, Texas. Stewart is a technology-driven, strategically competitive real estate information and transaction management provider. Stewart Title Guaranty Company provides title insurance, escrow and closing, and related services through more than 9,500 issuing locations in the United States and international markets.